FAITHFUL ADDITION. Hull Historical was called upon to duplicate trim details for an addition to a 1920’s classical revival residence. The casing is a simple square stock pattern with a back band added (HHBB05, from the Hull Molding Catalog). This molding tells the story of the architectural transition from arts and crafts to the period revival movement. Hull Historical Millwork published the “Historical Moldings Catalog” (published by John Wiley and Sons), a catalog which not only makes available 650 of the most popular moldings in the Victorian, Arts and Crafts and Period Revival styles, but which is in itself a research tool for the field, enabling designers, builders and preservationists to identify moldings and properly place them in their historical and stylistic context. These are all faithful “Standard” moldings, modeled from historic samples and from the original catalog cuts. This catalog is an outgrowth of research that Brent Hull was doing for a book on historic millwork. In working on the book, he assembled what is maybe the biggest archive of original period millwork catalogs in the country, over 70 catalogs printed from 1870 to 1940, an era he refers to as the “Golden Age” of historical millwork. It occurred to him that the most practical and immediate means for presenting the subject was as a working catalog that furnished historical background for each molding, including a description of its stylistic elements, the time period during which it was originally available and an original period illustration. This catalog will continue to serve the needs of the industry in future editions by making available additional moldings from the period as interest arises and by placing them in their historical context. The Catalog is available from Hull Historical, Inc. of Fort Worth, Texas. More information on the catalog and ordering moldings can be found on the company’s web site at http://www.hullhistorical.com. STILL IN SESSION. 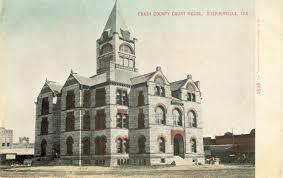 Hull Historical Millwork reproduced windows for a restoration for the 1885 second empire style Erath County Courthouse in Stephenville, Texas. 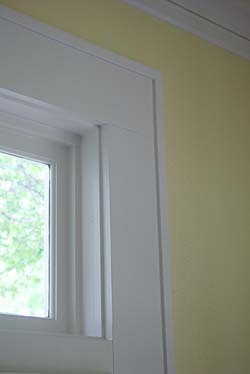 Hull managed to located one surviving original window for a pattern to replace all windows from a 1980’s retrofit. The casing (molding HHCS021 from the Hull Molding Catalog) dates to the first “Universal Catalog” of the late 1880’s, fabricated from reclaimed, old-growth long leaf yellow pine to match the original. This entry was posted in Millwork and tagged Manuals and Catalogs, Texas. Bookmark the permalink.